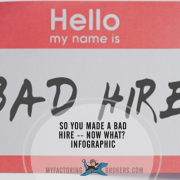 When we found an infographic on common mistakes candidates make during job interviews, we couldn’t help but think that mistakes happen on the other side of the table too. 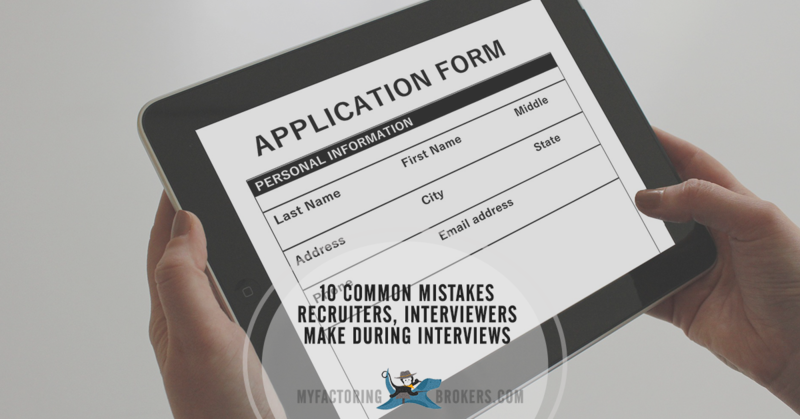 Here are common recruiting mistakes interviewers make that can turn the best candidates away. When we found this Classes and Careers infographic with a list of job interview tips for candidates, we decided it was time to do another mirror image with a list of interview tips that recruiters and staffing specialists can use to ensure they do all they can to land top talent. A 2015 Talent Trends Report by LinkedIn found that 83% candidates say that a negative interview experience can change their mind about a role or brand they once liked. However, 87% of candidates say a positive interview experience is equally powerful, and can change their mind about a company or role they once doubted. Given that a candidate might even be offered a position after a single interview with a hiring or staffing manager, or the candidate’s prospective manager, it should come as no surprise that nearly 8 out of every ten candidates say the interview was extremely important to their ultimate decision whether to accept – or reject – a job offer. Nearly 100% of candidates said that the interview was somewhat or vitally important to their decision, only 4% of candidates said the interview didn’t impact their decision at all. 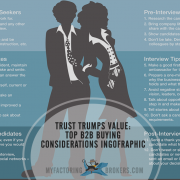 We previously published an article titled Mirror Image: 12 Tips for Recruiters Who Want to Attract the Best Candidates in which we reversed a list of tips for job candidates inspired by a Doherty Employment Services infographic. Failing to make eye-contact or neglecting to smile can leave a negative impression on candidates who might believe that you (and your company) is not friendly or genuine. Acting bored, watching the clock or not paying attention when candidates are speaking might cause them to believe you aren’t interested in them or what they have to say. Candidates might even stop talking or shorten their answers, depriving interviewers of valuable information about their skills, knowledge, background or personality that could have otherwise improves hiring outcomes. In most cases, by the time an interview takes place a candidate has invested hours in researching position openings and prepping for the interview. Recruiters should review a candidate’s resume, online portfolios or work samples, social media profiles, etc., prior to the meeting in order to ask good questions and avoid making the interview a repeat of all the information available in their resume and application. No matter how busy you are, if you cannot conduct an interruption-free interview it might be better to postpone a meeting until you can. Interruptions can stop the flow of conversation, lead to oversights and send the message to candidates that you believe your time is far more important than theirs. Likewise, starting late or making candidates wait more than a few minutes in between interview rounds sends the message that your time is more important that of the candidate’s. 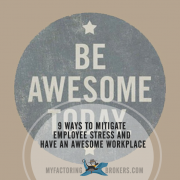 It can also be indicative to a prospect that being late to meetings is part of company culture, setting the expectation that a job in the company might be frustrating due to inefficiencies. Recruiters who are too impersonal or fail to demonstrate humor or warmth will lead candidates to believe that the organizational culture is lacking in these areas. Being personable during an interview helps put the candidate at ease. Not only will they be more likely to look favorably on the brand if they have rapport with the recruiter, the trust this engenders is also likely to make them more forthcoming. Conversely, recruiters who are too informal or conduct interviews more like a lunch date with a friend than a prospective employer might leave a candidate in doubt about the professionalism of the company’s culture. Even attire matters. A candidate might feel very uncomfortable if they perceive they over-dressed or under-dressed for an interview. Recruiters can eliminate unnecessary tension by dressing to match the same type of attire they expect most candidates to don for the interview. Likewise, the attire worn by company ambassadors during an interview sets expectations about how they would be expected to dress on the job. It’s normal for a hiring or staffing manager to probe deeper if they want a candidate to clarify something or even to challenge a candidate’s answer. Recruiters need to be sure that in their pursuit of information, they don’t come across as hostile or overly-aggressive, since it might lead the candidate to believe that they’ll be treated similarly if they accept the role. Candidates have questions too. Recruiters need to be prepared to answer a candidate’s questions honestly – even the tough ones. If talent believes that a hiring or staffing manager is withholding information about the role, why it is open, what the company culture is like, who they will report to, etc., it can lead to doubts about whether they should accept a job offer. There’s wisdom behind the ancient axiom, “If you can’t say anything nice, don’t say anything at all.” Recruiters have a corporate duty to present the job and company transparently, but that doesn’t mean the interview is a time for airing dirty laundry. Not only is a reflection on company culture, it creates doubt in the candidate’s mind about what you might say behind their back, too. 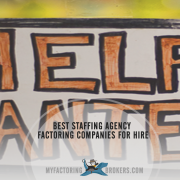 Our staffing factoring and payroll funding services make it easier for staffing and temporary employment agencies to meet operational expenses and keep up with payroll cycles. With rates as low as 1%, free same day funding, advances up to 98% and a no-cost, no-risk application process, we encourage you to request a staffing factoring proposal to compare against your current program or find out how factoring can immediately speed up your agency’s cash flow.